Blueming Gardens Farm is an educational farm and a CSA or community supported agriculture (we call it our "farm shares"). 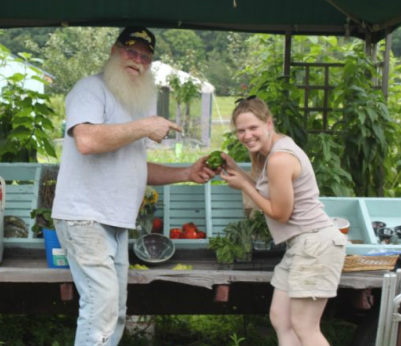 It is a place to garden, providing a wholesome source of home-grown foods for friends/clients/community members. The blue barn in Cornpropst Mills is a safe haven for our beloved animals and a serene place for the hard-working hands of staff and volunteers to tend the gardens and enjoy the fruits of their labor. Neighbors and other visitors often come to appreciate the farm we share, especially the children who enjoy the animals so much. Everyone is welcome at the farm, but we ask that dogs be leashed (the cats and chickens appreciate this!) and that visitors stay out of the barn and buildings unless we are there. Since we do not live at the farm, visitors can call in advance to see if we are available for a personal tour. Donations of egg cartons are always appreciated, and the horses love apples, carrots, and horse cookies! Gardening is our passion! We love to share our knowledge. We hold two events annually that the public is welcome to enjoy with us. Farm Day is held in the middle of August. We show appreciation to our visitors who are welcome to enjoy the farm and share a meal with us on this special day. Our Organic Gardening Workshop is held in early May. Come and enjoy our presentations and demonstrations on several gardening topics including composting, plant propagation, weed control strategies, use of cover crops, extending the gardening season, demystifying heirlooms, benefits of raised beds, trellis systems, nutrient maintenance, using compost/manure, compost teas and much more! Our farm has opportunities for events like weddings, birthday parties, and educational visits for groups like girlscouts, home school programs and charter schools.